So I’m a 13 year old pitcher and I’m not sure if I should throw curveballs and sliders quite yet. I had 2.92 ERA and a 70% strike rate in my last season. I throw an 85 MPH fastball and I have a pretty nasty change up. I also have a pretty good splitter, knuckleball, sinker, and a really nasty cutter, but I don’t know if I should start throwing curveballs and sliders. So I have come here to ask some more experienced baseball players and coaches. I know that I can throw these pitches well, but I’m not sure if I should in games. I really want to but I just don’t know. Chris Sale is my pitching idol and I want to start working on my slider as soon as I possibly can because my goal is to throw a slider as nasty as his by the age of 20. Please respond quickly because my debut is tomorrow for my new team and I really want to perform well. I’m going to be playing on this team for the next few years and my entire career is on the line tomorrow night. If I don’t pitch well tomorrow then I won’t get any playing time in high school and college and I will never play in the major leagues which is my goal and dream. I am extremely nervous and I feel like if I throw sliders and curveballs then I will be able to get more strikeouts but I am worried about ruining my arm. Please let me know if it’s ok for me to throw those pitches so I can if It’s ok for me to. Thanks so much guys. It doesn’t seem like you need to add a slider or CB yet. Those numbers are pretty dominating. Is this your first year at the 60-feet-6 pitching distance? At 13U throwing an 85 mph fastball for 70% strikes your era would be 0.0 playing against the highest level of 13U players in any given area. 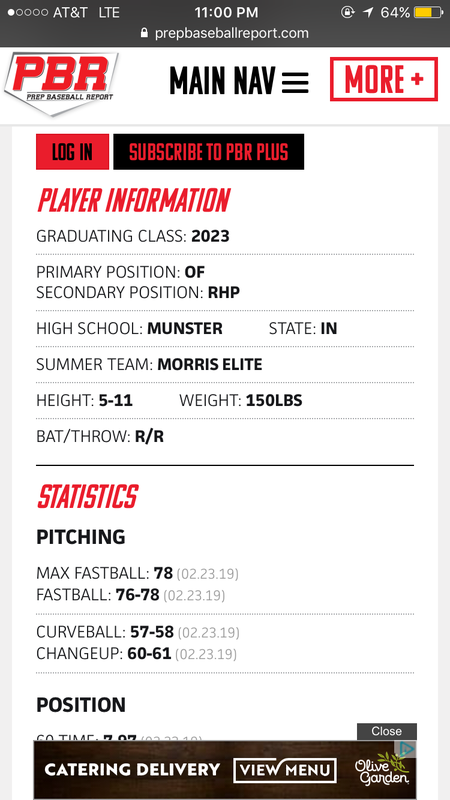 The top fastball max velocity for the 2024 class recorded by Perfect Game across the entire country this year is 85 mph with only 5 13 year olds touching 80 mph. 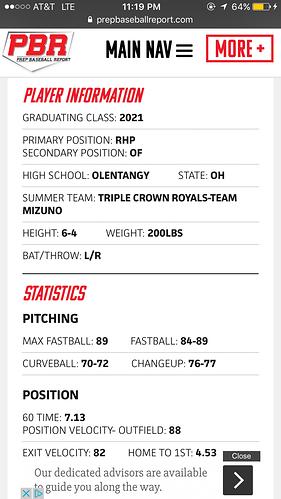 You are basically saying you are possibly the hardest throwing kid your age in the nation and you also throw a change, splitter, knuckleball and sinker but you are giving up almost 3 earned runs per 7 innings. Something is not adding up here. Thank you. My team plays on a major league sized diamond and it is my first year throwing that distance. Im just worried about not getting very many strikeouts and I feel like I would get more especially with the slider, but im worried about two things. 1: Ruining my arm. 2: Not throwing consistent pitches. I can throw a slider, but I haven’t really had quite as much practice with it as I really wanted to. sorry i meant I top out at 85. Ive only thrown 85 maybe 10 or 15 times in my life and i usually hover around 70-80. i can hit 85 if really wanted to though. sorry for the confusion. I believe that you should not throw a slider because it is worse on your arm than a curveball. Also, you noted you throw 6 pitches in total. It would be much more efficent if you simplify your reportoire to a fastball, change and curveball. Maybe keep the sinker in there but other than that it looks better if you have 2 or 3 pitches you can really command and control well rather than a bunch. So for my thoughts, if you are in middle school etc then throw the curveball because it still can screw your arm up if you do not throw it right but much healthier on the arm than a slider. By the looks of it, it seems like you have the basis of a good reportoire. Just simplify it and learn to use a fastball change and a curve. Maybe one more specilty fastball (sinker) to finish out your entire arseneal. Sorry for the long response, hope this helps and good luck in your season you will be great. Also quick question, what grade you in because I am currently a junior in high school and i did not really put emphasis on breaking ball development until my 8th grade season of baseball. Regardless of the numbers. Pick your best 3 pitches, not including the knuckle ball, and focus on mastering those. Too many pitches can be confusing during a game, plus you would need to spend way too much time on 5+ pitches during bullpens to stay up on them. Knuckleballs are for old men and hurt arms. Young man, there isn’t a 7th grader on this planet who throws 85mph. And as pointed out earlier, you would have an era of 0.00 at that age if you did, even if all you threw was fastballs. My son is a sophomore JV pitcher at a pretty competitive high school and he doesn’t even get close to 85. In fact, there are only two kids in the entire school who throw 85. One is a 6-5 220 lb junior with a scholarship to Indiana University who is the #6 ranked overall player in the state in his class and the other is a 6-4 215 lb freshman who is the #2 rated pitcher in his class in the state. My boy played on a 13u travel team with seven kids who are now pbr pre season all state selections. Not one of them came anywhere near 85mph at the age of 13. Top speed was around 73-74 mph. In fact, my son now plays on a 16u travel team that plays in college showcase tournaments and they have only one pitcher at 85mph or above. I suggest you slow your roll a bit young man. Like I said to TXJIM, Ive only hit 85 MAYBE 10 or 15 times in my life. I usually hover around 60-75 (I said 80 to him but thats pushing it). Sorry for any confusion but I am not some kind of superkid who pitches at a major league scale, and im not trying to make anybody think that I am. I dont lie about my skills, and with all due respect, I would appreciate it if you would not doubt me. I am not the best pitcher in the world and I understand that, but I am a very skilled pitcher and I have no reason to lie about myself. Also, can you explain to me why I would have an ERA of 0.00? I dont quite understand why you would think that. 60-75 MPH fastballs are around the average for my league and level and I personally hit those all the time and so do my teammates and everybody else in my league because that is what the pitchers throw at an average. I am one of the hardest throwing pitchers in my league, but normally the other pitchers throw around 50-65. And AGAIN, like ive said 3 times already, Ive only hit 85 like 10 times in my life. I think the issue is this, you are coming onto a forum with a lot of experienced people. People who have played and who have kids that are your age. You start out saying you throw an 85 mph fastball. Then its 70 to 80 but you threw 85 a few times and now its 60 to 75. For those of us who have been around the game or have mentored younger pitchers, the things you claimed don’t add up based on our experience. For example, I have a 15 year old and a 12 year old who both pitch in a pretty good baseball state. We have played from Texas to Florida to Cooperstown against everything from AA to elite level competiton. In my experience with both of them, and the dozens of kids they have played with and against, 13U kids that even throw close to 75 are pretty dominant pitchers. I just can’t imagine an area where there are multiple teams full of 13 year olds barreling up 75 mph fastballs on a consistent basis. Furthermore, pitching velocity is the most over stated stat in the history of sports. People just overestimate their own velocity, their kid’s velocity and ther opponent’s velocity. We have all seen it, and most of us have done it ourselves. Then the radar gun comes out and its not even close. We are not trying to be mean here but you simply don’t seem like you are being honest with us, or yourself, or maybe both. I understand why you would think this, the numbers I put forth are pretty hard to believe, but we have some excellent hitters in our league, and I did not come on this site to brag, but I am the hardest throwing pitcher in my league and the second hardest throwing in the county and one of the hardest throwing in the state. I am not saying that I am a baseball god or anything, but my entire family is very into baseball and I have been playing the game for 9 years. I will admit, I have a lot to learn about the game, but i just came on this site to get some advice from some more experienced players about pitches that I should throw. I did not come here to be criticized or doubted. I gave my stats, and I asked if I should throw curveballs and sliders based on them. I didn’t ask to be doubted. Im sorry if you dont believe me, but please tell me, what reason do I have to lie? What is the benefit of me lying about my stats? Its not like I know any of you in person. Its not like I have anything to prove or anyone to impress. I just wanted some advice, but I guess I over estimated the kindness and understanding of the internet. I am very sorry that you dont believe me, but with all due respect, I have nothing to prove to you. Just out of curiosity, what league do you play in? Is it truly league play or tournament ball? Do you travel to play or just play against other local teams? We play against local teams but I believe if we win the tournament then we will travel and play other teams. Gotcha. Back to your original question. No, I do not think you should worry about curveballs or sliders right now. I would also recommend that you drop all of the other pitches you throw. With a live arm throwing 75 mph plus at 13U I would have you spend all of your time learning to locate that fastball. In-out-up-down, hit spots consistenly on command. I would also work on a traditional circle change with the same arm speed and slot as your fastball. Once you have mastered getting batters out with that combo then start working on a curveball when your body is more mature. At the end of the day, at the highest levels, its a fastball game. Develop the pitch that every scout is going to look at first then worry about the rest. Best of luck to you. 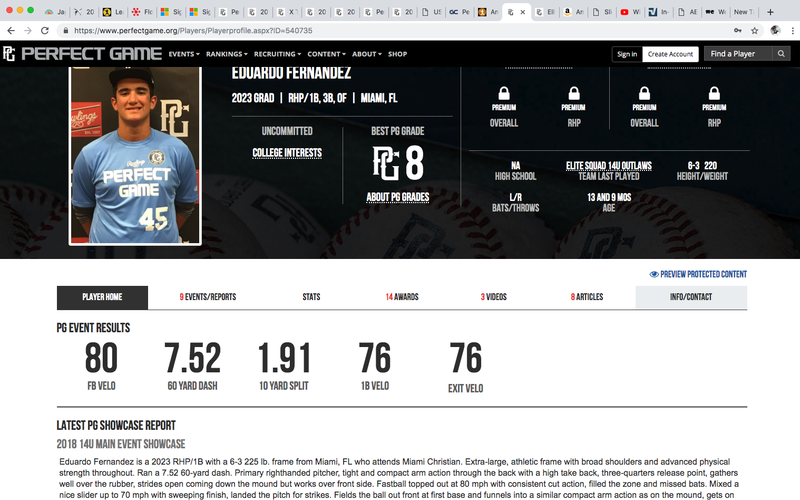 This is what the profile of an elite pbr 14 year old prospect looks like. Look at his velocity range (within two miles) and then look at his max velocity (two miles above that). There are not 10-15 mph gaps, like in your story. Fwiw, Perfect Game had only ONE recorded 85mph for a 13 year old last year, in the entire country. And his era would have to be zero or close to zero because the overwhelming majority of 13 year olds can’t even see, much the less hit, an 85 mph fastball. 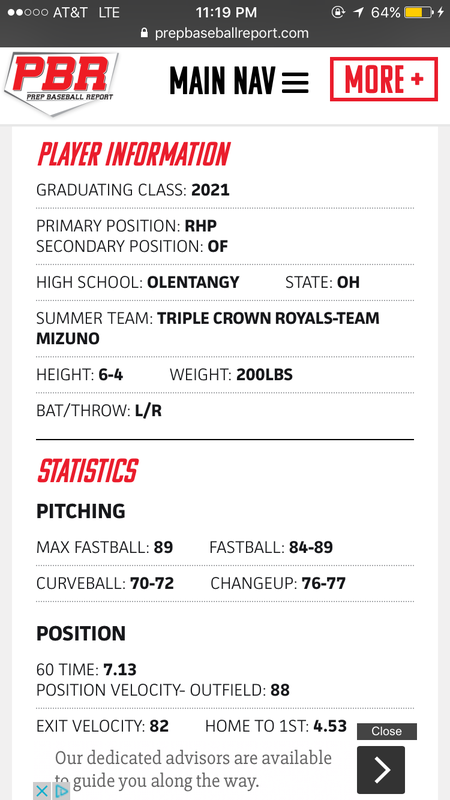 This is the current pbr profile of the top rated rhp in the Ohio class of 2021, a kid my son pitched against in a 13u tourney in Elizabethtown, Kentucky a few years back. He’s already committed to Ohio State. But what you’re trying to tell me is you’re three years younger but throw almost as hard as he does?